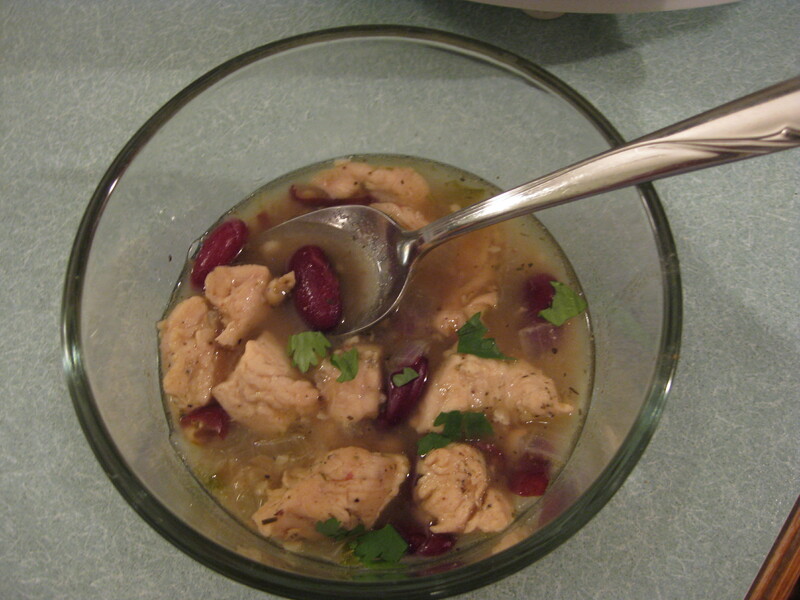 White Bean Chicken Chili ~ Summer IS Crock Pot Season! I associate crock pot cooking with cold, winter days, but recently it occurred to me that summer is an even better time for using the crock pot. Kansas City was expected to be in the triple digits for several more days. I didn’t want to turn on the oven or stand over the stove for long, and I surely didn’t want to stand on my west-facing deck next to a hot grill in the late afternoon sun! Yet we need to eat. For the most part I’m happy with picking at bits from the frig, but The Pretty One really needs a meal to keep him going. Between 40-50 hours a week at his internship and 9 hours of online summer classes, he needs “real” food. The Pretty One eats at the golf course when he’s working, but golf course food typically isn’t very healthy. Menus are designed for speed, not nutrition. Once he’s home, he heads to his laptop to study and take his tests for his online courses, so I like to have something healthy ready for him. It seems weird to make chili in the summer, but I guess it shouldn’t since we eat hot foods all year round. I found this recipe on Taste of Home. It’s not a thick and creamy white chicken chili, so don’t expect that. I followed the recipe closely, but added a bit more pepper since I wasn’t feeding anyone who is spice-challenged. The flavor is great! It had just enough pop without being too much. The consistency, though, wasn’t what I expected. It’s more like a soup than a chili, so I took one of the reviewers’ suggestions and add a cup or so of cooked brown rice to it. I think the rice made it a more filling dish that was still somewhat light. Click for recipe. I’m happy with this recipe and think it’s a nicely-spiced, healthy meal that didn’t heat up the house. The crock pot may become one of my go-to kitchen tools this summer. In fact, I’m already looking for more recipes to try! « Banzai Birthday: Snickerdoodle Bars for Alex!